South Korea’s largest food manufacturer Nongshim on Tuesday said its Japanese affiliate rose 22.6 percent on-year to reach $9 million in the first quarter, buoyed by its enhanced marketing efforts. It marks the biggest on-year sales hike ever recorded among Nongshim’s overseas branches as well as the largest sales volume logged by Nongshim since business began declining in 2012, the firm said. “Since first exporting (its flagship spicy ramen) Shin Ramyun to Japan in 1987, we have been building our brand power around the product and pursuing various marketing strategies. Such efforts have led to the recent sales hike,” a Nongshim official said. For one, Nongshim set April 10 as “Shin Ramyun Day” in Japan in 2010, and has since been carrying out diverse promotional events annually. It is meant as a play-on-words on the Japanese pronunciation of “hot” in English, which sounds similar to the English pronunciations of the numbers “four” and “ten” in Japanese. 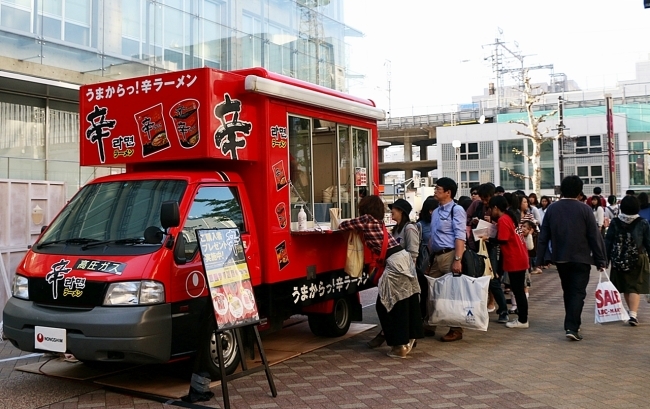 Nongshim has also been operating its “Shin Ramyun Kitchen Car,” a food truck that offers consumers a chance to taste the flagship instant noodles, in Japan since 2013. Every year, the truck travels across Japan for seven months, promoting Shin Ramyun to locals. The truck has hosted a total of 150 tasting sessions and traveled more than 100,000 kilometers. Nongshim Japan also recently joined hands with the Fukuoka Softbank Hawks, the representative baseball team of Kyushu Island, to carry out various promotional campaigns across the country. “As the birthplace of ramen noodles, Japan is a symbolic country which we cannot ever give up on,” said the company official.